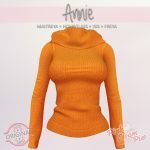 Marketplace Review on Annie Ugly Sweater [Orange] Awesome! Comes with Maitreya auto-hide and is a great fit. The orange color is extremely vibrant. I will definitely be buying additional colors.